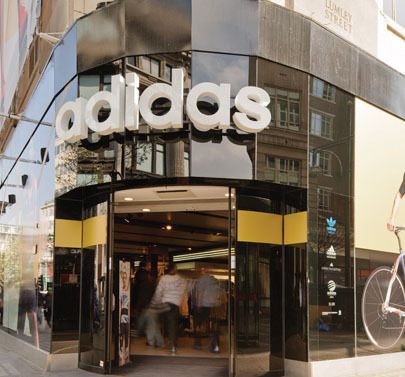 When global leading sporting brand Adidas decided to rebrand and refit a flagship store in London, it was essential the entire retail experience was second to none and that had to start with the entrance on busy Oxford Street. With constant foot traffic, performance and durability were of utmost importance, as were striking aesthetics. For these reasons, automatic curved sliding doors from DORMA, the global market leader of door controls, automatics, glass and movable walls, were specified. With the 1800m2 interior designed by New Store Europe, the entrance had to not only give a positive first impression and clear statement of the companys image but would also allow a smooth flow of traffic. DORMA BST automatic curved segmental sliding doors met the brief and offered the client the highest standards of design, functionality and comfort. Complete with the reliable DORMA ES curved sliding door operator, the sliding leaves are made of clear glass while the side panels have been specified in black glass to tie in with the rest of the frontage. As part of their commitment to sustainability and creating a comfortable interior, DORMA sliding doors open and close efficiently to help buildings maintain their internal temperatures, therefore keeping heating and cooling costs down. When it comes to the specification and installation of customer entrance doors in retail stores, special considerations must be given to the doors operation, reliability and safety. They must not only ensure that the building is secure, but also contribute to the overall design of the building. Building owners must also consider the long term maintenance costs and operational features when specifying a door system. Automatic swing and sliding door operators can help to increase traffic flow whilst also ensuring simple and efficient access for all users, including elderly and disabled patrons. Sliding doors are often the most popular choices at store entrances as they allow the most efficient access for all customers, as well as staff members. BST automatic curved sliding doors excel in reliability and user convenience. The self-learning microprocessor control unit keeps the system running smoothly and reliably. Combining with the integrated presence sensor, it also ensures maximum operational safety. With the store now open, the stylish door closers further enhance the buildings stunning contemporary aesthetic. Thanks to the high quality, high performance automatic sliding doors provided by DORMA, the Adidas store provides safe, smooth and reliable access to customers and staff.